Fig. 1: (left side)Normal Scapular rotation (right side) Scapular winging. The scapula, also known as the shoulder blade, is the triangular shaped bone that sits against the rib cage on the outer portion of the upper back. 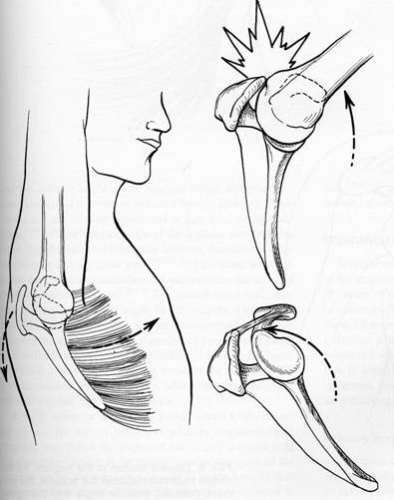 Normal shoulder motion requires that the scapula rotates outward and forward (Fig 1: Left side). 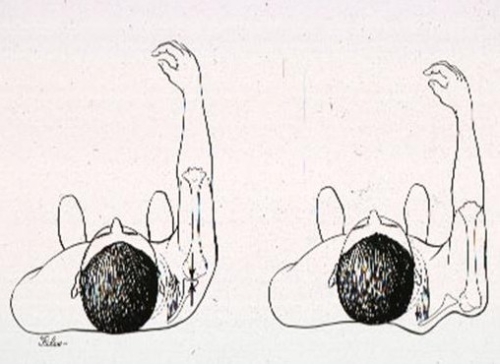 If one or more of the scapular stabilizing muscles does not work properly the scapula wings and moves in the opposite direction of the shoulder joint (Fig. 1: Right side). This results in limited motion. 1.) What is normal scapulothoracic motion? Normal shoulder motion requires not only movement of the shoulder joint (glenohumeral ball-in-socket) but also the scapulothoracic joint. The scapula is a triangular bone and the outer (lateral) end of this bone is the socket of the shoulder joint. Normal movement of the scapula allows us to use the shoulder and arm in sports, work and daily living (See Figs. 2 and 3) Fig 2: Upward and forward rotation allows us to raise our arms overhead. This is achieved by several muscles attaching to the scapula. The Serratus Anterior pulls the scapula forward and rotates the socket upward. The Trapezius rotates the scapula outward and the socket upward. Fig. 3. Normal upward and forward rotation of the scapula allows the ball-in-socket shoulder joint to remain stable . This is analogous to a seal balancing a ball on it’s nose by positioning it’s body underneath the ball using all of it’s trunk muscles. 2.) What are types of abnormal scapulothoracic motion? Weakness of the muscles controlling the scapula results in abnormal motion that we call scapulothoracic dyskinesis (from the greek dys- meaning “abnormal” and kinesis meaning motion). Scapulothoracic dyskenesis may be the result of fatigue of the scapular stabilizing muscles, and this may occur from overhead sports or work activities. Indeed, athletes with shoulder pain will often have abnormal scapular movement and this is an important part of their recovery with a physical therapy rehabilitation program. In it’s most severe form Scapulothoracic dyskenesis is the result of a nerve dysfunction either from trauma or idiopathic causes (unknown cause). Fig. 5: Scapulothoracic dyskenesis may be associated the scapula sitting lower than the other side and also further away from the spine. This is due to fatigue and stretching of the scapular stabilizing muscles. 3.) How is a diagnosis made? Loss of scapular control is often missed. The patient may develop pain in his(her) shoulder and there may or may not be loss of overall shoulder motion. In some cases the patient may have shoulder instability due to failure of the scapula to fully rotate (Fig. 6) Fig. 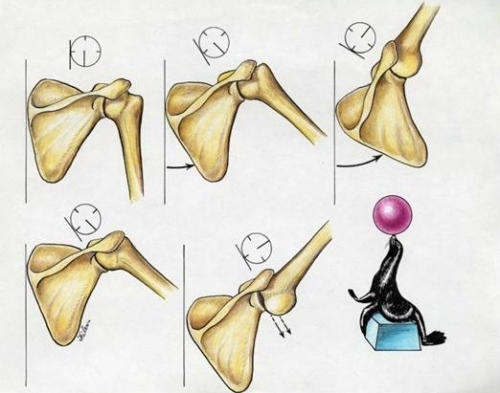 6: Normal rotation of the scapula allows for a stable socket platform for the humeral head (ball) of the shoulder joint (left image). 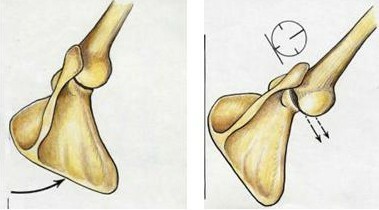 Failure of the scapula to rotate outward and forward may lead to shoulder instability due to loss of a stable platform (right image). Scapulothoracic dyskinesis may be associated the scapula sitting lower than the other side and also further away from the spine. This is due to fatigue and stretching of the scapular stabilizing muscles. Fig. 7 and 8: If the scapula does not move forward the socket may not be in a position to stabilize the shoulder against posterior instability (out the back) (top image). 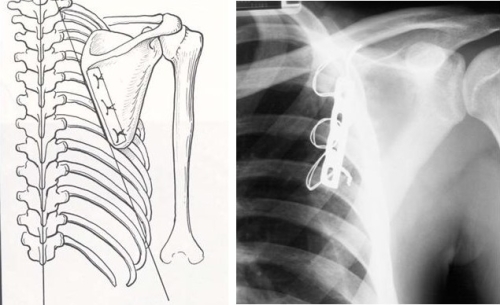 A patient may be treated for shoulder instability by surgery without recognition of the winging as a principle cause of the instability (bottom image). Detection of abnormal scapular motion starts by visualizing the patient’s shoulder from behind the patient and observing if there is a normal pattern of motion. Some patients present with pain that may seem like a rotator cuff problem. This is due to abnormal motion which allows the rotator cuff to hit against the acromion bone. This condition has been called impingement. Normal function of the scapular muscles allows the acromion to move out of the way of the advancing humerus. If there is weakness of the serratus anterior muscle, the scapula fails to rotate out of the way of the humerus and the result is impingement and irritation of the rotator cuff. (See figure 9). 4.) Are their different types of winging? There are three types of winging. Which type a patient has depends on which muscles are involved. 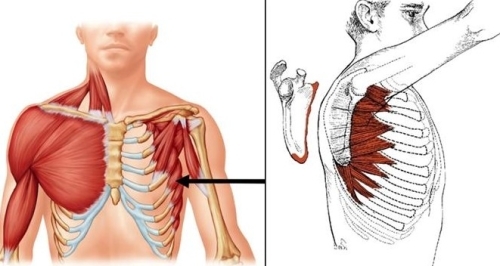 The serratus anterior is a strong muscle which attaches to the ribs on the chest and connects to the inner border of the scapula. When the muscles fatigue or are not functioning properly, they lose the ability to control the scapula. Fig. 10: The serratus is made up of many separate muscle bellies which originate from the ribs (left image, arrow) and attaches to the medial underside of the scapula (right image). This is the muscle most commonly associated with winging. 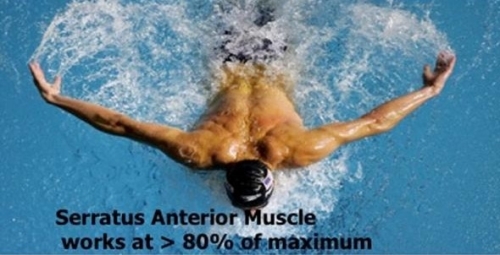 In sports such as swimming the serratus anterior may fatigue as it must work at a very high level. This can lead to shoulder pain by the mechanisms described above. Figure 11: Fatigue of the serratus anterior with sports activities like swimming may cause pain in the front of the shoulder or even instability. Severe winging may occur due to an injury to the long thoracic nerve (Fig. 12). This nerve innervates (supplies) the serratus anterior muscle and it originates in the neck (Cervical spine level 5 and 6). When the nerve no longer ‘fires’ and no force comes from the muscle, scapula becomes unrestrained. The long thoracic nerve may be injured by a stretch or a compression either in the neck or as it runs along the chest. Causes of a long thoracic nerve injury include compression or stretching with a fall, motor vehicle accident or other trauma. Sometimes there is no clear cause of winging and then it is believed it may represent a viral infection of the nerve (viral neuropathy). 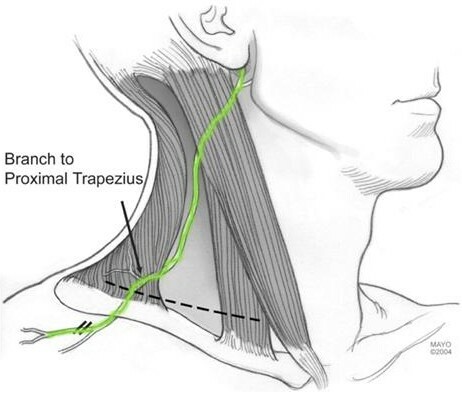 Figure 12: The long thoracic nerve (arrows) comes from the C5,6 levels in the neck and runs down through the neck and along the chest wall to the wall to the serratus anterior muscle. The diagnosis is usually confirmed by an EMG (Electomyographic study) to evaluate nerve function. This is performed by a neurologist who is an expert in such tests and it measures the speed with which the nerve conducts an electrical impulse as well as the magnitude of that impulse. A damaged nerve might be analogous to a fiberoptic cable unable to transmit a signal for an image or the signal may be slow to come and disordered so the picture is not so clear. A less common form of winging that may also result in weakness and pain. The trapezius is a very large triangular muscle which supports the scapula suspending it from the spine and the neck. It works to rotate the scapula outward to the side and upward so that the glenoid socket points up allowing for the arm to be raised overhead out to the side. It also helps an individual shrug their shoulder (Figs. 13, 14) Fig. 13: The trapezius is a triangular shaped muscle composed of an upper (U.T.) and lower (L.T.) portions. Fig. 14: Spinal accessory nerve course in the neck where it is at risk for injury from trauma or surgery. Fig. 15: FSH results in marked weakness of the scapular muscles and inability to raise the arms. How is Scapular Winging treated? In the case of winging due to long thoracic nerve palsy (serratus anterior palsy), most cases recover but do so slowly and this may take up to one or two years for maximum recovery. Physical therapy is not generally helpful and may actually exacerbate winging by further stretching the long thoracic nerve.The natural course of Serratus Palsy 2 to 31 yearsFew reports suggest that surgical decompression of the long thoracic nerve may be indicated early; however, it is difficult to know if this is the best approach as most patients recovery without surgery anyway. Microneurolysis and decompression of long thoracic nerve injury are effective in reversing scapular winging: long-term results in 50 cases. The arm is in a sling for four weeks to allow the transfer to heal; however, passive range of motion begins after the first 7-10 days. After four weeks the sling is removed and the patient is permitted to use the arm for simple daily living but no lifting. Physical therapy to restore flexibility continues. After 12 weeks biofeedback training may be added to the therapy program to help train the tendon to contract as the arm is raised (Fig. 18). Fig. 18: Biofeedback is performed with a small pad placed over the pectoralis muscle and the patient gets feedback on muscle contraction by either color change or sound change on the biofeedback monitor. Pectoralis major tendon transfer for the treatment of scapular winging due to long thoracic nerve palsy. 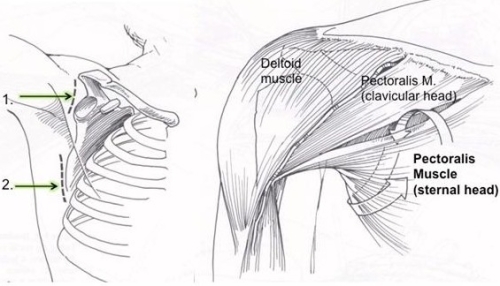 Direct pectoralis major muscle transfer for dynamic stabilization of scapular winging. Surgical treatment of winged scapula. 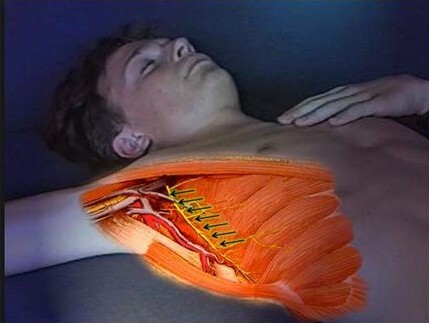 Pectoralis major transfer for serratus anterior paralysis. Results of pectoralis major transfer with fascia lata autograft augmentation for scapula winging. Results of transfer of the pectoralis major tendon to treat paralysis of the serratus anterior muscle. Split pectoralis major transfer for serratus anterior palsy. Many patients may have only mild weakness or be willing to tolerate their weakness and dysfunction. If the dysfunction of the spinal accessory nerve follows a surgical injury, the nerve does not usually recover. If the patient has a significant disability and pain then a tendon transfer may be a solution.The tendon transfer is called the Eden-Lange procedure and it involves transfer of several muscles. The levator scapula, the rhomboid major, and the rhomboid minor are transferred so as to have a similar orientation of the trapezius so they can substitute for it’s loss of function (Fig. 20). Fig. 20. 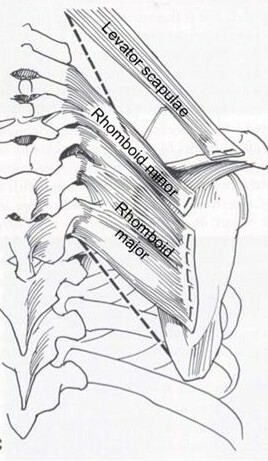 The Eden-Lange procedure transfers the rhomboid major, rhomboid minor, and levator scapulae so as to replicate normal trapezius muscle orientation. Aftercare following Eden-Lange procedure: The shoulder is protected in a sling for 4 weeks after which active and passive motion begin. Lifting is avoided for 4 months after surgery. Results of the Eden-Lange Procedure for trapezius palsy are generally good with most patients noting improved motion and pain relief. Levator scapulae and rhomboid transfer for paralysis of trapezius. The Eden-Lange Procedure. In such cases, or when a tendon transfer has failed, there may be no tendon transfer solution. For these patients a fusion of the scapula to the ribs (scapulothoracic fusion) may give stability to the scapula which allows the patient to raise his(her) arm overhead (Fig. 20) Fig. 20. A scapulothoracic fusion is performed by fixing the scapula to the ribs using a plate and wires and using bone graft to ensure a solid fusion. As it may take many weaks for a strong fusion, the shoulder is immobilized in a sling for up to 12 weeks. During this time elbow, wrist, and hand motion is permitted. Once a solid fusion is evident (usually on a CT scan) the patient is permitted to move the shoulder and begin therapy. Most patients derive significant relief of pain and improved function after a fusion, though complications are not rare and include pneumothorax (air in lungs), hemothorax (blood in lungs), non-union (failure of fusion), and need to remove wires due to irritation at a later date. In our experience, about 80% of patients indicate their function and pain are improved. The outcome of scapulothoracic fusion for painful winging of the scapula in dystrophic and non-dystrophic conditions. Scapulothoracic fusion for clavicular insufficiency. A report of two cases. Scapulothoracic fusion for painful winging of the scapula in nondystrophic patients. Scapulothoracic fusion for serratus anterior paralysis. 1) Kibler WB, Sciascia A, Wilkes T. Scapular dyskinesis and its relation to shoulder injury. J Am Acad Orthop Surg. 2012 Jun;20(6):364-72. Review. PubMed PMID: 22661566. 2) Meininger AK, Figuerres BF, Goldberg BA. Scapular winging: an update. J Am Acad Orthop Surg. 2011 Aug;19(8):453-62. Review. PubMed PMID: 21807913. 3) Uhl TL, Kibler WB, Gecewich B, Tripp BL. Evaluation of clinical assessment methods for scapular dyskinesis. Arthroscopy. 2009 Nov;25(11):1240-8. PubMed PMID: 19896045. 4) Wiater JM, Bigliani LU. Spinal accessory nerve injury. Clin Orthop Relat Res. 1999 Nov;(368):5-16. Review. PubMed PMID: 10613148. 5) Warner JJ, Navarro RA. Serratus anterior dysfunction. Recognition and treatment. Clin Orthop Relat Res. 1998 Apr;(349):139-48. PubMed PMID: 9584376. 6) Galano GJ, Bigliani LU, Ahmad CS, Levine WN. Surgical treatment of winged scapula. Clin Orthop Relat Res. 2008 Mar;466(3):652-60. Epub 2008 Jan 8. PubMed PMID: 18196359; PubMed Central PMCID: PMC2505206. 7) Streit JJ, Lenarz CJ, Shishani Y, McCrum C, Wanner JP, Nowinski RJ, Warner JJ, Gobezie R. Pectoralis major tendon transfer for the treatment of scapular winging due to long thoracic nerve palsy. J Shoulder Elbow Surg. 2012 May;21(5):685-90. Epub 2011 Jul 1. PubMed PMID: 21723148. 8) Steinmann SP, Wood MB. Pectoralis major transfer for serratus anterior paralysis. J Shoulder Elbow Surg. 2003 Nov-Dec;12(6):555-60. PubMed PMID: 14671518. 9) Romero J, Gerber C. Levator scapulae and rhomboid transfer for paralysis of trapezius. The Eden-Lange procedure. J Bone Joint Surg Br. 2003 Nov;85(8):1141-5. PubMed PMID: 14653596. 10) Teboul F, Bizot P, Kakkar R, Sedel L. Surgical management of trapezius palsy. J Bone Joint Surg Am. 2005 Sep;87 Suppl 1(Pt 2):285-91. PubMed PMID: 16140801. 11) Hassan A, Jones LK Jr, Milone M, Kumar N. Focal and other unusual presentations of facioscapulohumeral muscular dystrophy. Muscle Nerve. 2012 Sep;46(3):421-5. doi: 10.1002/mus.23358. PubMed PMID: 22907234. 12) Jeon IH, Neumann L, Wallace WA. Scapulothoracic fusion for painful winging of the scapula in nondystrophic patients. J Shoulder Elbow Surg. 2005 Jul-Aug;14(4):400-6. PubMed PMID: 16015240. 13) Elhassan B, Chung ST, Ozbaydar M, Diller D, Warner JJ. Scapulothoracic fusion for clavicular insufficiency. A report of two cases. J Bone Joint Surg Am. 2008 Apr;90(4):875-80. PubMed PMID: 18381326. 14) Sewell MD, Higgs DS, Al-Hadithy N, Falworth M, Bayley I, Lambert SM. The outcome of scapulothoracic fusion for painful winging of the scapula in dystrophic and non-dystrophic conditions. J Bone Joint Surg Br. 2012 Sep;94(9):1253-9. PubMed PMID: 22933499.